The Audi A4 has become one of the best-selling compact executive cars on the market. Most of the growth in ownership of Audi’s flagship sedan can be traced to the fact that it is a comprehensively solid car. Audi’s precision engineering is even more evident in the redesigned 2017 model year, which combines timeless styling and a powerful engine with a welcome level of quality. Audi’s styling and engineering make it the perfect commuter car—indeed, there are few cars more comfortable, or more intuitive, than the 2017 A4. But what happens when you want to break away from the daily commute and have your A4 take you on an adventure? At 13 cubic feet, the A4 beats or matches its in-class competition, the Mercedes C-Class and BMW 3 Series. But 13 cubic feet still can leave a lot to be desired—or, more accurately, a lot of gear left in the garage! We’ve all been there. “Let’s get out of town for the weekend!” It’s a great sentiment, and there are few things more enjoyable than throwing an overnight bag in the trunk and hitting the road. If, like us, a weekend away isn’t the same without your gear, though, you can find yourself in a tight spot. Limited trunk space may not be the deciding factor when you purchase or lease your Audi, but if you’re a cyclist, or a kayaker, or a skier, you will feel that pinch eventually. If you’re looking to bring your gear, there are always options—some more appealing than others. Yes, you can finagle your bike into the trunk—front wheel off, back wheel in first, chain up to avoid dirtying up the carpet, and careful going in and out of the trunk that you don’t scratch the paint on the lip. Best of luck trying to get a second bike in there, of course. And, if you’re hoping to drop the kayak in the lake, this isn’t really an option; same for hitting the slopes. You can buy an aftermarket, trunk-mounted rack. It might scratch the paint on your trunk lid, they are notoriously insecure—both in the “not having people steal your bike” sense and the “your bike will totally still be attached to your car when you get where you’re going” way—and they are single-use accessories. The A4 carrier bars, on the other hand, are easy to install. That they are an OEM accessory means they do not suffer from the aesthetic and performance issues common to even the best aftermarket parts. 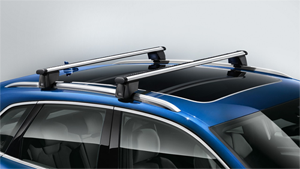 The bars are right-sized, the towers do not damage the paint on your roof, and you know that any rack or carrier you buy will fit perfectly. On top of the base carrier bars, you have the ability to install a locking bike rack, a small or large luggage box, a kayak holder, a ski or snowboard rack—anything to transport the bulky, awkward items that make a weekend getaway something more.